Way back in the mists of time, Slime was approached by the mysterious producerJeeroj, whose unique take on acid was a revelation for us. Invested with emotion, humour and personality, his music was light years away from our usual output but we simply couldn’t resist his charms. The resulting love affair brought ‘Selected Acid Works’ into reality, his debut long player for the label and the culmination of many years worth of time spent honing his sound in sweaty bedrooms and dark basements. Fast forward to this year, and Jeeroj is back with his sophomore effort ‘Midnight Resistance’, and the question is always the same – how do you follow up something that took ten years to make? The answer is simple. Extract the formula and expand it into brand new galaxies of sound. ‘Midnight Resistance’ takes all of the charm of the former release and catapults it through brave new worlds – touching on italo disco, jungle, house, breakbeat, techno and of course lashings of acid. It shows a satisfying evolution to his sound and holds a promise for what’s to come in the future. 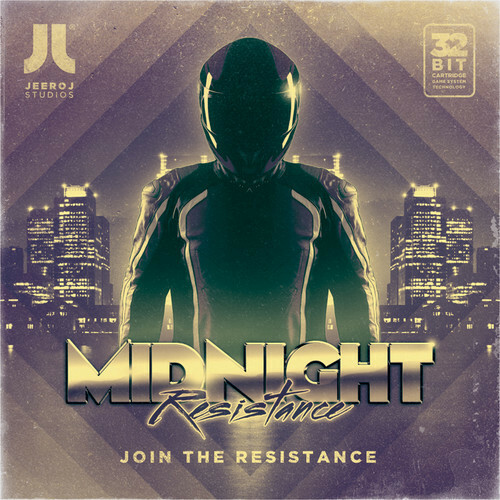 ‘Midnight Resistance’ sounds like the soundtrack to some long-lost giallo masterpiece, ice-cold electro beats, slap-funk bass and marauding keys the companion to a scene of some leather-trousered maverick driving his roadster recklessly through neon-slicked city streets. ‘Sunday Drive’ shuffles and undulates into being with a cavernous acid squiggle creating the sonic tentacle that slowly penetrates your cerebellum and squeezes your brain dry. ‘Sproket’ drifts in on a haze of bucolic melodies, building up into an exhilirating labryinth of jungle rhythms that short circuits your brain back to it’s pagan roots and will have you burning effigies of the old gods in next to no time. ‘Take My Pocket’ sounds like the official anthem of the Nation of Cthulu, and rest assured when they awaken from their thousand years sleep and dredge themselves from the bottom of the sea this will be playing as they eat our souls. ‘Ambient Seagull’ creates a warm ocean of sound in your mind, lapping up against your amygdala with profound results. ‘Could It Get Any Worse’ takes the husk of Human League, stretches it to snapping point and then launches it into the heart of the sun. The resulting supernova shines radiation down on our faces as we look to the heavens whilst the sky burns. ‘Doubletto’ straps a panic alarm of a kick drum to echoing atmospherics, inducing paranoia and jubilation in equal amounts within all those who hear it. ‘CSRD XVII’ sounds just about as close to an anthem as you can get, if your idea of an anthem is a bottom-heavy acid freakout strapped to warehouse-grade rave music. ‘Mincely’ sparkles with glittering keys and low rolling bass stabs before unfurling in the final furlong with a glorious jungle rinseout. ‘Space Lounge’ brings proceedings to a close with laconic pads wrapped around a bouncing kick drum, spiked through the centre with melancholy acid lines, tweaks and bleeps.